Recently, Mallorca was declared the best city to live in in the world. But, this island’s little sister, Menorca, doesn’t fall far behind. It is one of the most beautiful islands in the world, and it’s not only an ideal place to live, it’s also a great place to visit, satisfying the tastes of all kinds of tourists, regardless of what they’re looking for. Menorca is known as one of the most relaxed islands in the Balearic Island chain. But in reality, this notion comes from comparing it with the louder, neighboring island of Ibiza. La isla blanca (the white island) is known internationally as one of the epicenters of electronic music in the summer, and by comparison, the almost nil party atmosphere on Menorca may make it seem “boring.” But it definitely is not. Menorca offers many different exciting activities. The most well known among them, without a doubt, is snorkeling, a sport that anyone can take part in, and which can be enjoyed anywhere on the island. You can explore the underwater world with the help of a snorkel (although you can’t dive very deep) while you take in the rich abundance of sea creatures living close to Menorca’s beaches. Snorkeling anywhere on the island makes for an absolute visual spectacle, even if you’re only a few feet from shore. Many tourists have only had to get half of their bodies wet and dunk their heads under water to see huge shoals of fish swimming all around them. Beach lovers will also find unique routes on Menorca. The most popular tourist beaches are accompanied by others that are less well known, or that are slightly more difficult to access since they don’t have access roads and getting to them can require long walks. Because of this, some of these beaches have maintained their status as unspoiled. Those great photos of white sand beaches surrounded by low mountains that can only be accessed by sea were taken precisely on this island. Menorca also offers a unique cultural experience. You can visit the taulas (meaning “table” in Catalan), architectural concepts built by the Talaiotic Culture, originating on Mallorca and Menorca in approximately 2,000 B.C.E, or in other words, more than 4,000 years ago. 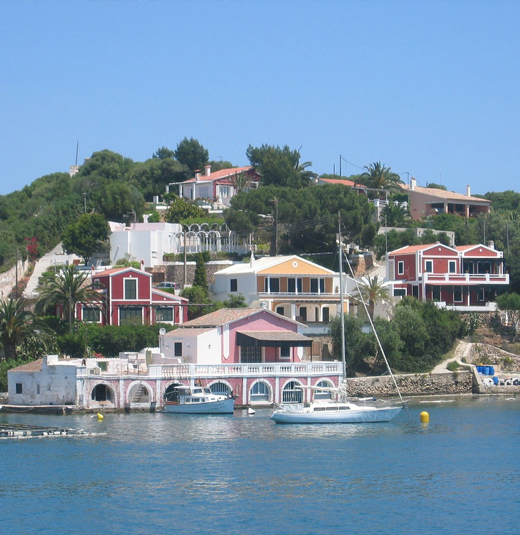 Lastly, Menorca, as we’ve already mentioned, is an island that has been unjustly categorized as “boring.” Its village fiestas and many tourist attractions give color to almost every day of the year. Furthermore, the disco Cova d’en Xoroi sits atop one of the islands cliffs, and offers one of the best views to tourists in a real cave in the mountains that has been climatized. There are morning, afternoon and night sessions, and music practically from Monday to Friday during the entire season. It is one of the most lively and beautiful places to see the sun set high above the sea. Posted July 13th, 2015 by amerispan amerispan & filed under Travel News & Info.